NEWSflash 02/2015 Having problems viewing this e-mail? Please click here. 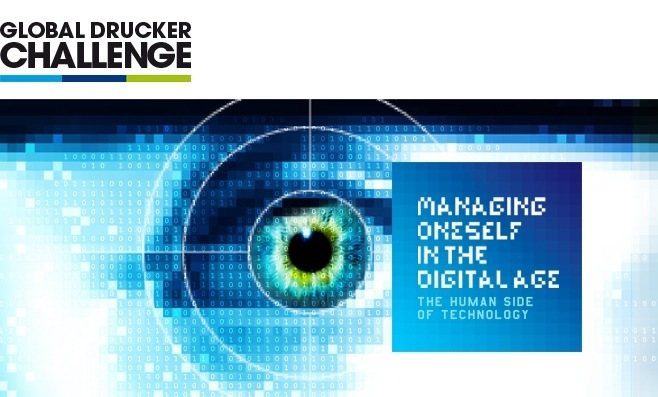 For most of the Challenge participants the journey started much longer before submitting their essay on the subject "Managing Oneself in the Digital Age - The Human Side of Technology". A journey that sculpted their lives as they scrupulously prepared: learning to write an essay, being tenacious, by participating in a contest across the planet to earn a place in the Drucker Forum in Vienna. The theme of the Drucker Challenge 2015 needed yet another skill: Being able to looking inside oneself to get the storyline with convincing arguments and to grasp that special Drucker spirit. Our jury panel for the 1st round of judging is now starting. Those who are shortlisted to be the best 15 will be announced by early August, with a final ranking 1 -10 by August 31. We warmly thank those who have submitted an essay for the Drucker Challenge. Our thanks also go to our sponsor Tata Consultancy Services, our premium partner The Frances Hesselbein Leadership Institute, and our global media partner Harvard Business Review. See you soon for the exciting results. Thank you for helping make Drucker Challenge one of the most ambitious contests in management. It's a record year with 220 authors from 56 countries having submitted their essay. We are looking forward seeing Peter Day from the BBC, who has accepted the challenge to moderate the Global Peter Drucker Forum 2015 parallel sessions with the winning authors. After having interviewed the Challenge winners 2014 he enthusiastically noted "These young people bring new perspectives which are essential for the vitality of the Drucker Forum".